HUGH BLAIR (1864-1932) was born in Worcester, England, and received his early music training as a chorister at the cathedral and as a pupil of the organist, William Done. While not planning on a career in music, he won the organ scholarship at Christ College, Cambridge, and after graduating in 1886 he accepted the post as Done’s assistant. Blair succeeded Done in 1895 on the latter’s death although, in reality, Blair had been de facto organist for several years. Blair was a close friend of the composer Edward Elgar, also a native of Worcester. Elgar was leader of the orchestra that routinely accompanied the Worcester Festival Choral Society at their regular concerts and at the Three Choirs Festival. Blair was instrumental in the creation and performance of several of Elgar’s key early works such as The Black Knight (which Elgar dedicated to Blair), Sursum Corda, the Organ Sonata in G, and The Light of Life. 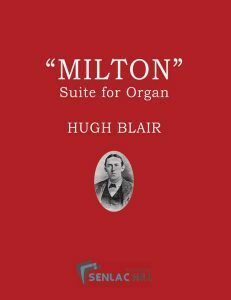 Blair’s “Milton” Suite for Organ, first published in 1917, was dedicated to Elgar. The suite consists of four movements each inspired by lines from the 17th century poet, John Milton, which Blair selected from Il Penseroso, Comus, and Ode on Time. Composed around the mid-point of the First World War, the work can be interpreted in the light of the prevailing nation mood which by this time was influenced by the unfolding tragedy of huge casualty numbers and little prospect of a victory. Despite this, Blair’s music seems suffused with a grim but sombre optimism.